Can an empty wine bottle refill by itself? Is it possible to break the bottom of a bottle without making it turn into smithereens? This may sound as ‘magic’, but in reality it is nothing more than… application of the laws of physics. Here you can see some “tricks” with which you can impress your friends, but in reality they simply “obey” the laws of Nature, writes Douglas Main in Popular Science, such as presented by Tim Shaw in the show «None of the Above» on the National Geographic Channel. Physics is a science with has brought plenty of applications in our daily life. And even despite the fact that as a school lesson it looks like Chinese arithmetic to many people, in fact it is not that difficult to understand! Just one small and simple experiment, such as the one presented in this post, which anyone can do at home, not only will surprise you with its results but will also demonstrate and help you better understand some of the basic physical laws. 5 Really Scary Optical Illusion Paintings That Will Astonish You! 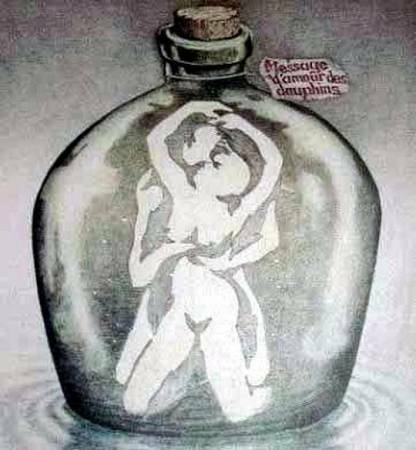 Normally I don’t post the articles like this, but these pictures really astonished me so I decided to share them with the readers of my blog who love optical illusions and are fond of the paranormal. A private collector from Spain has a unique collection of old paintings with stereo effect, which makes the image change at an angle. At first sight, you can see a depiction of people from the past times. However, once you change the view angle, a scary picture of an evil creature will appear before you. These paintings are really creepy! Enjoy! Everyone has limits, for example, how fast he can run or how long he can stay without water. But what about the limitations of our five senses, which in essence are the tools we use to perceive our environment? Approximately one quarter of the brain is involved in visual functions, so the sight is unquestionably the most important sense for our perception of the world. It is certainly the most well-known limit of our senses. The human eye recognizes light with a wavelength between 390 and 750 nanometers. At the same time, some animals are able to perceive light at other wavelengths. Here is an optical illusion of motion and color perception, which can reveal if you have normal psychological concentration. In the following article you will find some of the best optical illusions and visual paradoxes. Focus on the stairs and you will see that in a while it will turn upside down. The first thing that impresses is definitely its name! Near-death experiences (NDE), like hovering over one’s body or meeting deceased relatives and friends, are mind games rather than insights into the afterlife, claim British scientists.